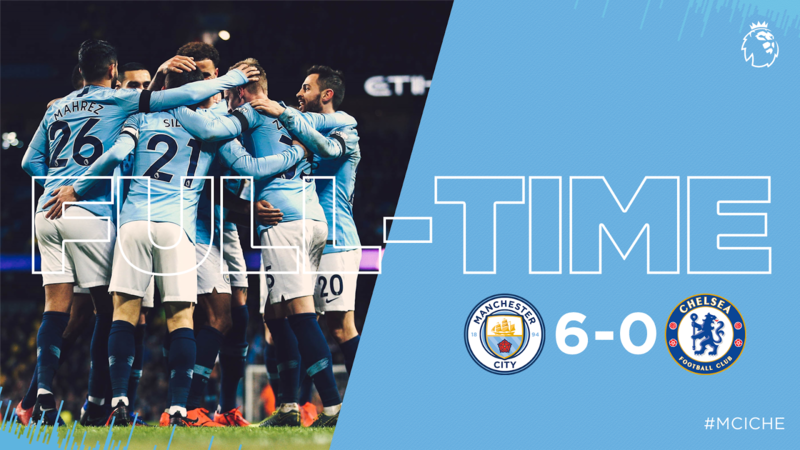 Sergio Aguero struck his second hat-trick in a week as the champions ruthlessly destroyed woeful Chelsea in a 6-0 win to return to the top of the Premier League. Third-placed Tottenham, who beat Leicester City 3-1 earlier on Sunday, are five points behind. Raheem Sterling fired City ahead in the fourth minute with a side-foot finish aftera quick free-kick from Kevin De Bruyne had caught the Chelsea defence napping. After Aguero had somehow missed an open goal from two metres, the Argentine promptly beat goalkeeper Kepa Arrizabalaga with a blistering strikefrom 25 metres. A poor header towards his own goal from Chelsea's Ross Barkley gifted Aguero with City's third goal and then a low drive from Ikay Gundogan made it 4-0 after 25 minutes. The defeat was Chelsea's worstsince their 7-0 loss to Nottingham Forestin 1991. Chelsea XI: Kepa, Alonso, Luiz, Rudiger, Azpilicueta, Jorginho, Kante, Barkley, Pedro, Hazard, Higuain.